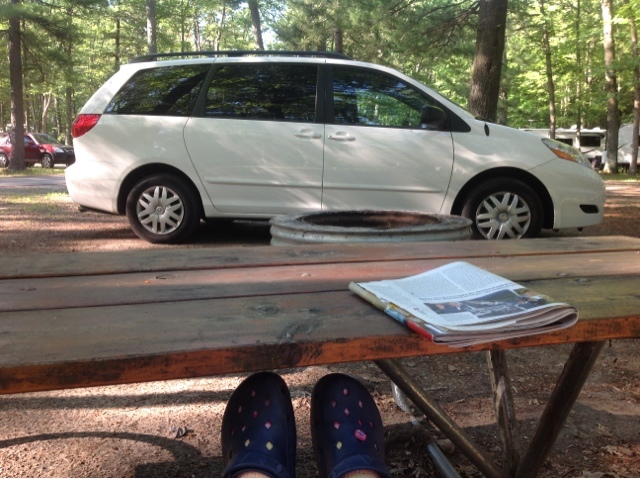 Last year after I bought my minivan camper I had a sad first night, night too cold and bed too hard. Fast forward to trial 2. Temperate temps, cozy bed - added a layer of memory foam. But in the morning my power side door wouldn't open with or without power. In fact the car battery wouldn't even turn over. A call to the dealer informed me that if the car battery was dead the only way to close the door would be to cut the cable, a very expensive option. Enter Power Rangers! Well, not quite, actually they are the college kids who work in the state parks in the summer. They brought a nifty device called a jump box. It's a self-contained jumper box. After charging it on house current, it stows neatly until you need it to jump start your battery, or even recharge your 12-volt devices, like phones and iThings. So off I went to buy one of each, a car battery (cuz I knew mine was a cheapo recycled one anyway), and a jump box. Not how I wanted to spend my lovely short vacation, guarding my electronics at the campsite, but it was a valuable day no less. I still don't know what drained my car battery, but I found a switch that toggles all the interior lights, and I turned them off. Here's hoping car starts in the morning. Window curtains covering middle side windows and side to side behind front seat - black fabric looped over bungee cords using panic grips, glasses holder, and clothes pins, white static cling covering rear vent windows, and believe it or not white heavy duty paper attached to tailgate window using Velcro tabs. So I can cover all or some of the windows as needed. One middle window screened with www.theskeeterbeater.com. The temperature was perfect last night with the window closed, so I can't guarantee the screen's effectiveness on a hot and muggy night, especially since my window's side posts are not metal. 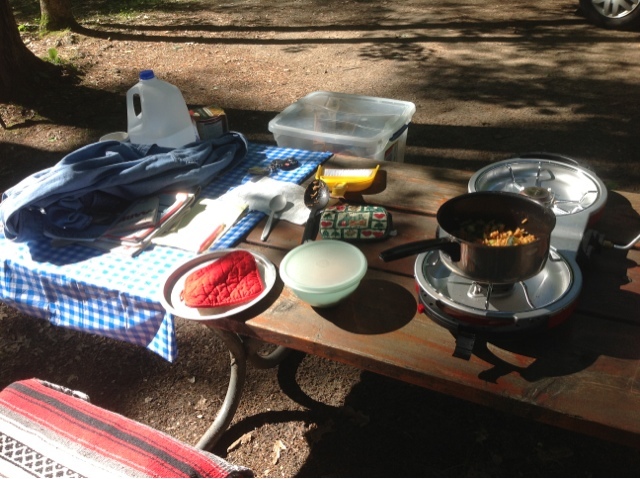 I've got my stove, fuel, pans and dishes tightly stowed, as well as my cooking accessories and personals. Eventually I will decide on a human waste receptical. Dang, apparently I can't add photos directly from my ipad??! So I will do that later. Dinner is packaged Spanish rice with corn and zucchini. Plus Chardonnay and Good n Plentys. The as yet unnamed camper van. View from the tailgate. Middle seats are tumbled forward. Left rear seat is stowed to create bed space. Right rear seat in position to create deep storage holding stove, "kitchen", and jump box. 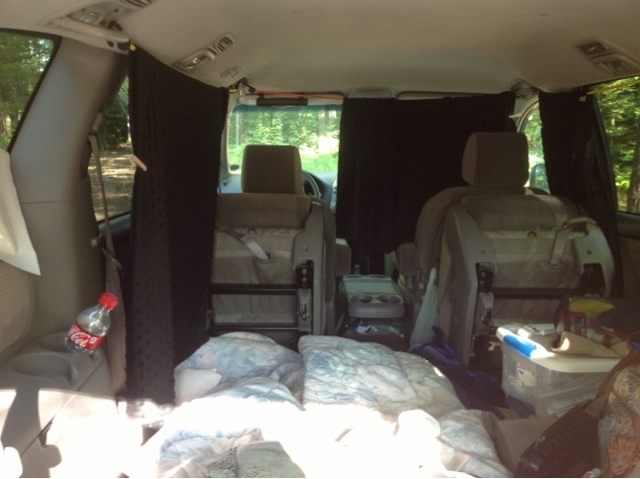 In front of rear seat: personals, clothes, and food box. Very small cooler is on front seat floor. So apparently the iPad Blogger app won't let me size my pics. Loved the Good 'N Pleanty dinner! I have a Honda Element that I camp in, so I'm enjoying your shake out trips. Good Luck! Candy was dessert. And GoodNPlenty pairs well with a nice white wine - especially the kind that comes in a screw top bottle. Now you know. Glad you are enjoying my road trials, mlk. use the option to choose and edit photo. Then when you edit the photo, there is a blue bar t the bottom that is used to adjust the photo size.